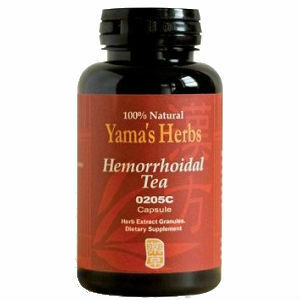 A deep red label and dark tinted bottle boast 100% natural properties of their hemorrhoidal tea capsules. Although there is no curative claim, the pills are said to be “good for” rectal bleeding and pain, chronic and acute hemorrhoids, pain and bleeding both during and after bowl movements. What precisely does that mean? Many products on the market make bold promises, but this understated product is going below the radar and actually seems to under promise results. It’s a curiosity for sure. What exactly should you expect from these all natural tea capsules? Tang Kuei -suppress pain by dispelling blood. Bupleurum and Cimcifuga- lift up Yang Qi. Rhubarb and Scutellaria- remove fever, toxins, and dampness. Tang Kuei- In Chinese Herbology Term- Tang Kuei promotes Dispel Blood, Open Meridians, and Stop Pain. Bupleurum and Cimcifuga- supports Yang Qi and Qi performance. There is no indication of how much or how little each of these herbs contain. In addition, one of these herbs has some rather questionable results. Although Dong quai has a variety of theoretical and historical uses based on animal studies, there is just too little human evidence that supports any effects of Dong quai for any condition. The recommended dosage is 3 capsules, taken 2-3 times daily. Contrary to these medically sound findings, Hemorrhoidal Teastates that their item is free from side effects associated to synthetic drugs. One bottle of Hemorrhoidal Teais set at $38.00 which includes 90 capsules. These pills are unavailable in larger money-saving quantities. If the recommended dosage is taken, you can expect one bottle to last approximately two weeks. There was no indication of a guarantee found anywhere on the internet. It’s difficult to say what type of quality backs the humble claims of this product. Despite searching a reservoir of websites, there were no reviews of customer experience. Without any indication of success rate among users, it is truly difficult to say if this is a product worth the investment. Another concern is the time frame. The website says that results should be experienced in approximately two weeks, with the effectiveness of the herbs on the system depending on consumer’s physical condition at the outset of ingestion. There is no indication if the product should be continued after the initial two weeks for maintenance of symptoms or anything else. The lack of reviews says it all. Either people aren’t purchasing this product, or those who are, are not seeing enough results– good or bad–to compel them to leave feedback. It’s tough to know if you should take a gamble or stick to a pill with an actual reputation. John Parker	reviewed Hemorrhoidal Tea	on September 3rd	 and gave it a rating of 2.